"Promising young racing car driver Joe Joe Quillico leaves the stock car racing scene in the United States in order to pursue Grand Prix racing in Europe. After limited success he manages to win the Spanish Grand Prix. His love life however, is much less successful and his winning on the track only serves to alienate the woman he loves - with unhappy consequences." I actually saw this movie (as well as Roger Corman's "The Young Racer's") in a real movie theatre. This 83-minute feature consists of about 78 minutes of yakety-yak, and 5 minutes of actual race footage. Directed by the justly-obscure Daniel Haller, this movie was a failed attempt to revive the career of teen heart-throb and lip-syncher Fabian (Fabian Anthony Forte), who, like many of the "philly-sound" teen idols of the early to mid-'60s had been drowned in the flood of the Beatles and Stones-led British Invasion. Thank God. 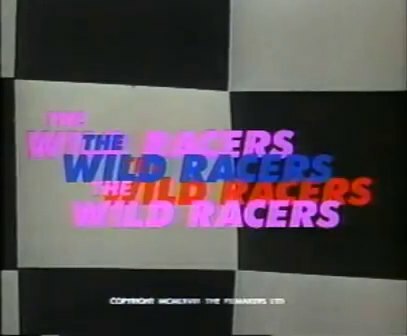 "The Wild Racers" also marked the screen debut of Talia Shire, Francis Ford Coppola's sister, and daughter of composer Carmine Coppola and Italia Coppola. aunt of Marc Coppola, Christopher Coppola, Nicolas Cage, Sofia Coppola and Roman Coppola, veteran of all 3 "Godfather" movies, and eternal wife of Rocky Balboa: "YO, ADRIAN!" There are much more vehicles in this movie visible, but only backgrounds ore blurry.